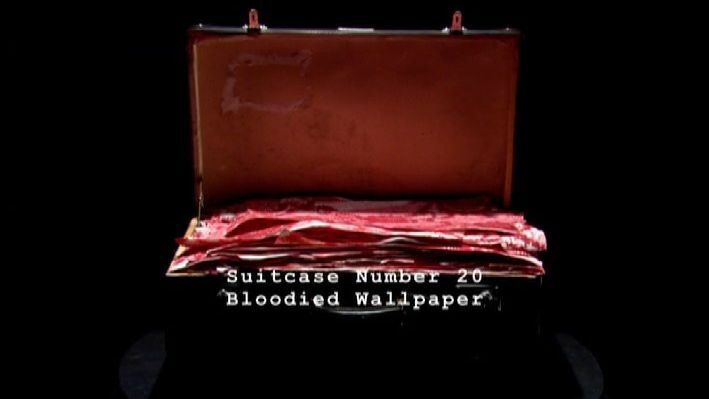 Peter Greenaway’s project “The Tulse Luper Suitcases” is the most ambitious work in Greenaway’s oeuvre; combining the types of media that he has dabbled with in his previous works and expanding them in a way that provides commentary on his previous work and the concept of the master narrative. Both suggest the project works within the framework of post-modern text by subverting modernism, as does the splintering of media within the framework of the project. Through the rough discursive overview of the project the post-modernism is evident, at least once it is understood that Tulse Henry Purcell Luper (henceforth Tulse Luper) is at least partially Greenaway’s creation. In this way, Greenaway is mixing fantasy with history rupturing modernism. 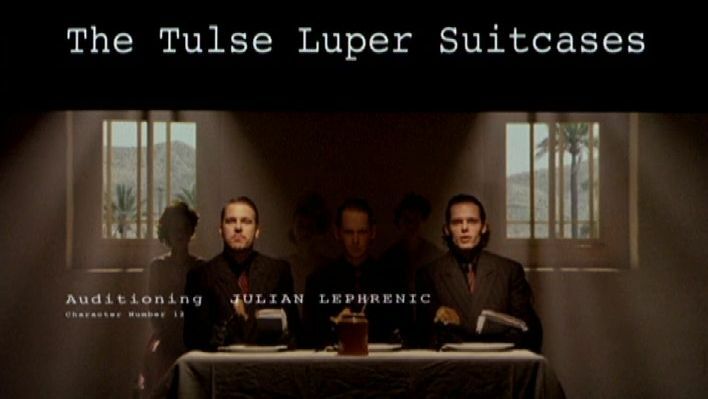 Also, by looking at Tulse Luper’s life through a cataloguing of (among other things) his possessions, Greenaway challenges the convention of the master narrative; using an arbitrary device as guide rather than a cohesive structure of events. The films, The Tulse Luper Suitcases: Pt. 1 The Moab Story (2003) and The Tulse Luper Suitcases: Pt. 3 Antwerp (2003) are not meant to be chronological representations of what happened in Tulse Luper’s life, but instead use the suitcases of the title to guide the progression of the narrative. 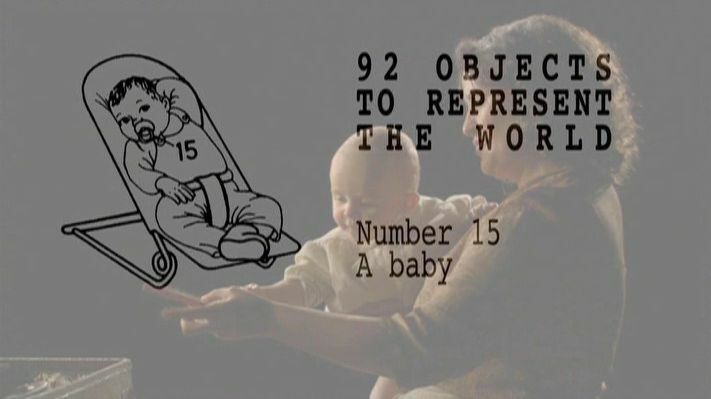 In this way, the project recalls various other works by Greenaway, most obviously his film Drowning by Numbers (1988) which tells of three women who drown their husbands (all named Cissie Colpitts – more on that later) but uses the numeric countdown from 1-100 to guide the progression of the scenes. 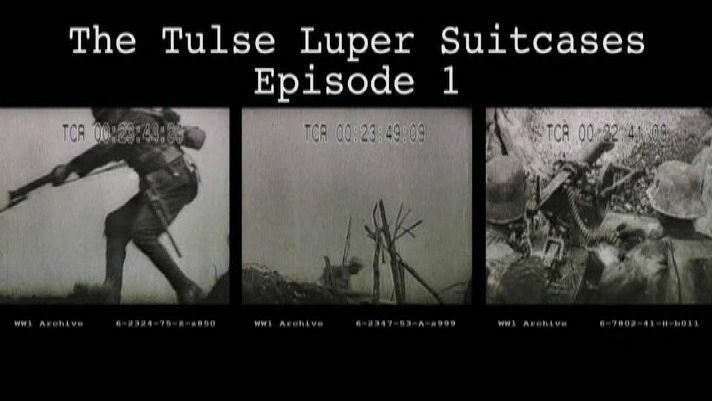 The “Tulse Luper Suitcases” project is however not limited just to film but spreads out (or will spread out) across four other forms of media. There will be television episodes made for the project, two CD-ROM discs, a series of books and there is currently a website (and active blog). Eventually, the project will be released to the public in a DVD box set that will contain 92 DVDs containing all of the films (there is a third film The Tulse Luper Suitcases: Pt. 2 Vaux to the Sea  – which is unseen by me) and the other information encapsulating the Tulse Luper archive. This quote gets to the heart of how Greenaway uses the separation across media in his “Tulse Luper Suitcases” project. 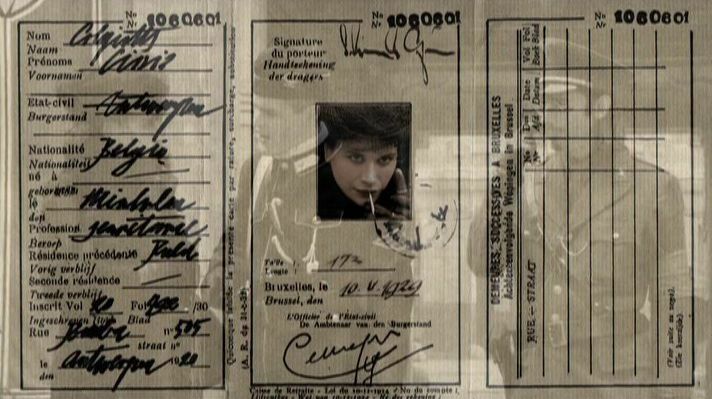 It is as if Greenaway is handing the authorship of his project to the viewer and giving them the freedom to explore it at enough length to support their own curiosity. 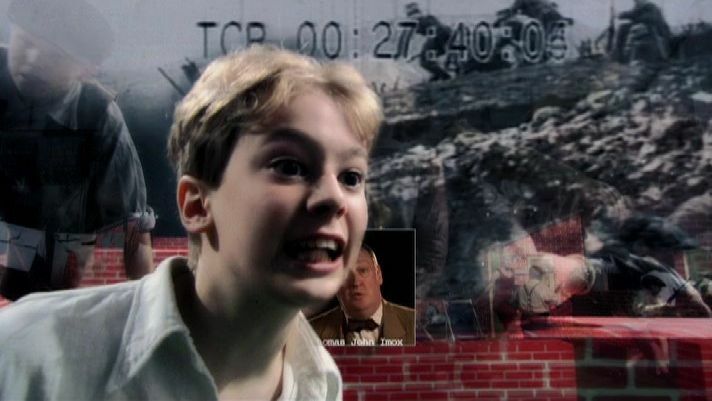 Eventually the viewer will be able to watch any of the 92 DVDs at home, and through their own selectivity they will create a structure to the text that isn’t preexisting. Likewise, if the viewer chooses to then explore the book, CD-ROM or internet for more information on Tulse Luper they will be creating their own experience in a way that will be totally unique to them, since the order and extent by which they explore this material will change the overall experience, comparable to the editing process as inflicted on traditional film. 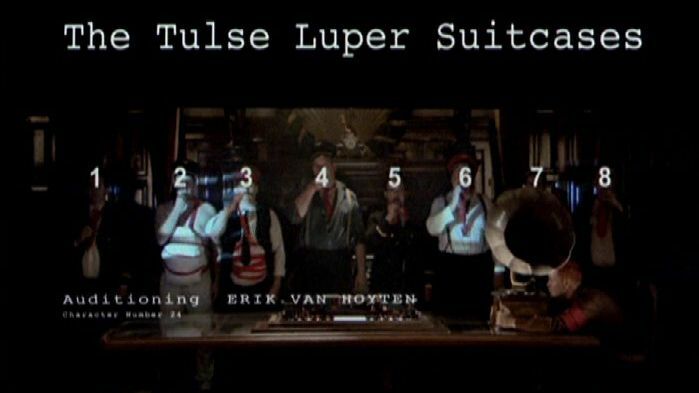 The narrative, such as it is, cannot be contained to the visual texts presented by Greenaway; insomuch as the internet blog is continuing the dialogue about Tulse Luper as is this essay. Another way the project cannot be contained is in the actual visual content of the films. They are layered in such a way that the “narratives” of the films overlap each other. They are also layered in the use of images, during the opening credit sequence and periodically as characters are introduced the film is spread out in a way similar to the interactivity of DVDs. 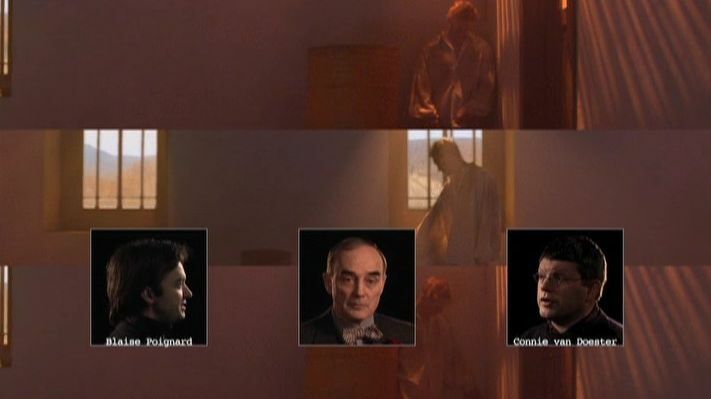 A character onscreen is introduced and Greenaway provides audition footage for the casting of that character and at other points of the films rectangular images float across a scene showing the set empty of the actors. Although perhaps these can be explained as a dramatic strategy by Greenaway to distance the viewer from the film by drawing attention to the artifice of the reconstruction, it is also another layer Greenaway is adding to the level of reality. 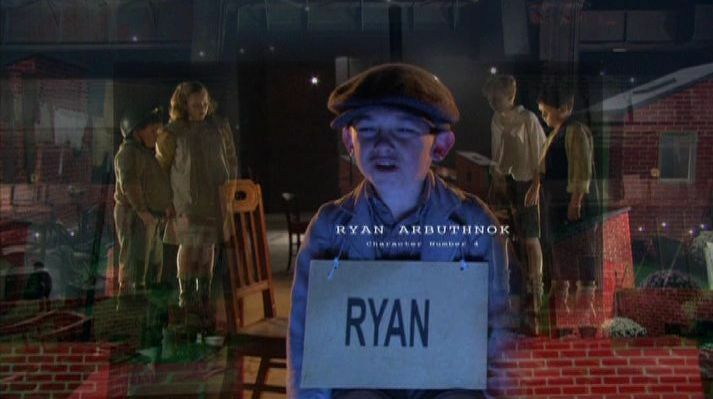 The characters are playing historical figures that are not real and neither are the characters real as they are played by actors occupying a space as though ghosts (with the viewer given a view of the empty room as it now exists, or existed at a point before or after the reconstruction). 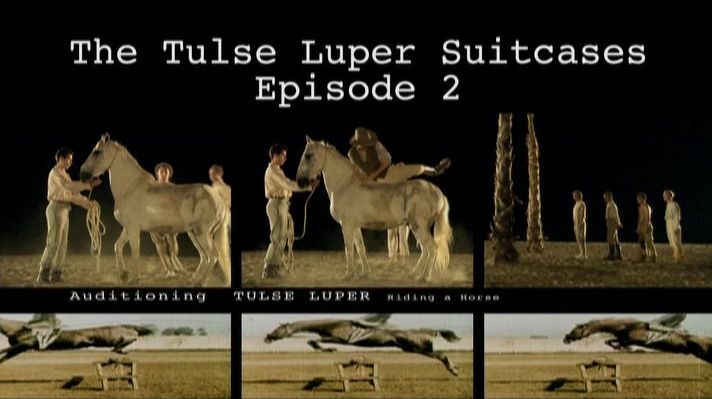 The Tulse Luper films also contain a good deal of textual information mixed in with the visual information, often giving more text than could be read in the amount of time it is onscreen. This simulates new media, in the way one would explore the internet or a CD-ROM, except presenting them within the filmic medium which is usually more often correlated with painting or theater. These paintings show interconnectivity in Greenaway’s work that extends beyond the actual assigned platform of this project and stretches across the painting medium, albeit in a way that is harder to trace. This also alters the traditional idea of the way a work is perceived because it assumes the viewer as familiar with Greenaway’s work outside of his “Tulse Luper Suitcases” project. 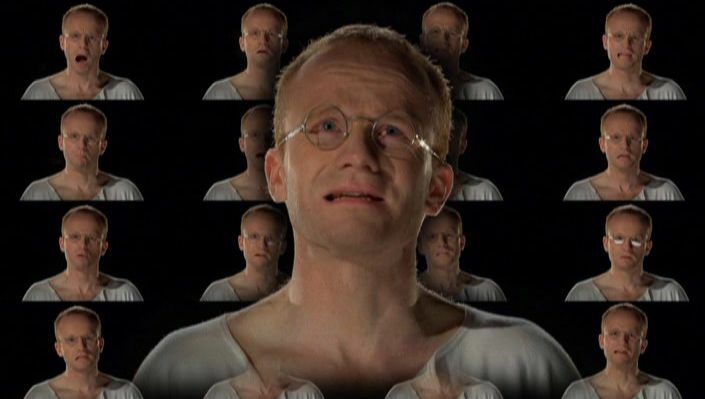 Without such reference to his painting, the film will not necessarily lose in meaning, but with them there is the potential for a film that is working on one more additional level: as a reconstruction of a historical place that is fantasy, being reconstructed for a film which is using previous documentation from another artistic medium. 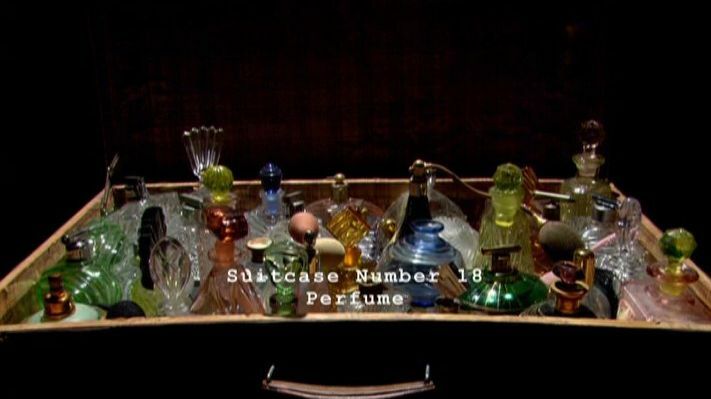 Furthermore, Greenaway had an installation and prop-opera called One Hundred Objects to Represent the World, which also takes shape in his films of The Tulse Luper Suitcases as another dividing database to sort the film (like the suitcases – but more like sub-chapters). 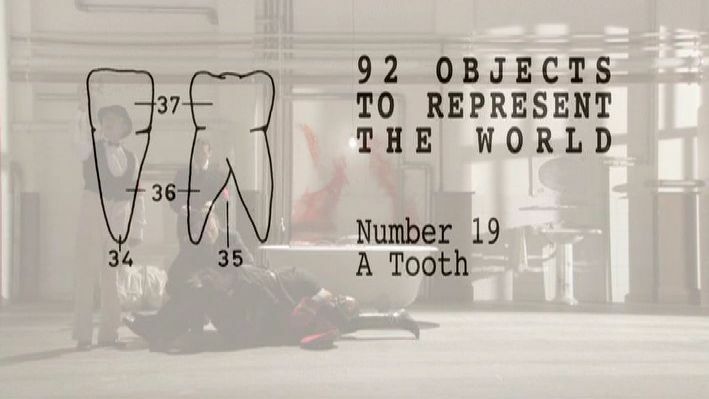 In the case of the films, they are the "Objects to Represent the World" (see right). 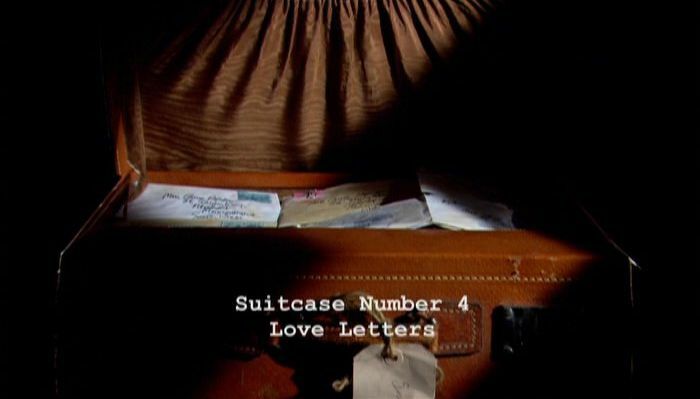 Also, Greenaway repeats tropes and characters over his film works, in Drowning by Numbers three characters are named Cissie Colpitts and that character name re-appears in The Tulse Luper Suitcases films. Once again these coincidences and parallel lines between Greenaway’s works to this project are emblematic of post-modernism and breaking down the master narrative by creating a work that is without barriers. For the viewer to understand these filmic and extra-artistic references to other works within Greenaway’s oeuvre is not necessary to understanding the work but does further the understanding the how the universe of the work is being constructed both by Greenaway and by the viewer. Peter Greenaway often makes grand statements about the state of cinema; saying that it is dead or on the brink of finally realizing its true potential as a medium. I think his “Tulse Luper Suitcases” project is an indication of the direction he wants to see cinema and other forms of media go in the future. By using post-modern theory to break down the walls of narrative cinema, Greenaway creates a cinematic world that can eventually become a freer reign of expression. However, I think it is potentially a slippery slope for Greenaway to continue along the lines of expression that he is currently coursing. A danger exists for the overloading of images to overtake the need for the production of new images, which is not a distinction as simple as quality over quantity but rather that a more exciting new form of expression will likely grow out of the image overload produced by the forms of new media. I think a center ground must be drawn between Greenaway’s experimentation and (for instance) Abbas Kiarostami’s minimalist experimentation with Ten (2002). I am not suggesting that somehow Hollywood cinema is the right answer in terms of pushing cinema into a new direction but rather that I think a more interesting form is likely to grow out of current movements made by Greenaway or Kiarostami, although probably not actually from their work pushing the boundaries of expression.